Whether the player chooses to race solo or against computer-assisted riders, they race against a certain time limit. The goal is to qualify for the Excitebike (the championship) race by coming in at third place or above in the challenge race (preliminary race). The times to beat are located on the stadium walls (for first place) and in the lower left corner (for third place). In any race, the best time is 8 seconds ahead of third place. When the player places first, then they get a message: "It's a new record!" Additional points are earned by beating the previously-set record time. The player controls the position of the red motorcycle with the Y-axis of the directional pad, and controls acceleration with the A and B buttons. Using B causes greater acceleration, but also increases the motorcycle's temperature shown as a bar at the bottom of the screen. When the temperature exceeds safe limits the bar becomes full; the player will be immobilized for several seconds while the bike cools down. Driving over an arrow will immediately reduce the bike's temperature. The pitch of the motorcycle can be modified with the X-axis of the directional pad: left raises the front, while right lowers the front. In the air, this rotates the bike, but can also be used to create wheelies on the ground. Pushing up or down turns the handlebars left or right, respectively, when the bike is on the ground. If the player runs into an opponent, lands badly from a jump, or crashes into a ramp, they will be knocked off the bike and land in the grass. Pushing A and B repeatedly allows the player to run back to the bike and continue the race. At the start of the game, the player can choose one of five tracks in which to race. ExciteBike has three modes of gameplay. In Selection A, the player races solo. In Selection B, CPU players join the player. They act as another obstacle; hitting one from the back will cause the player to fall off the bike, while any CPU riders hitting the player's rear wheel will cause them to fall off. In Design Mode, the player has the ability to build his or her own racing tracks. The player can choose hills and obstacles of various sizes and place them, represented by the letters A-S. The player can also choose where to finish the lap, and how many laps there are (up to nine). After it is finished, the player can race the track in either Selection A or Selection B. The Japanese version of the game allowed saving the player-created tracks to cassette tape, requiring the Famicom Data Recorder peripheral (basically the Famicom equivalent of the C-64's Datassette). Since this peripheral was only available in Japan (intended for use with Nintendo's Family BASIC), track saving was effectively unavailable to American and European players even though there are "save" and "load" options present within the in-game menus of those versions (the game's English manual states that "Save and Load menu selections are not operable in this game; they have been programmed in for potential product developments"). These options were removed in the e-Reader version of the game. 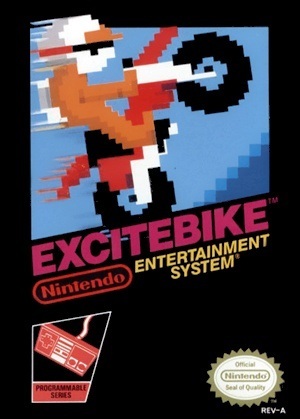 Unlike Wrecking Crew, Excitebike was never re-released for the Famicom Disk System in its original form. Subsequently, courses created within the version available on the Wii Virtual Console release in all regions can actually be saved to the Wii's internal memory.